POMEROY — Three decades of service and a million safe mills. 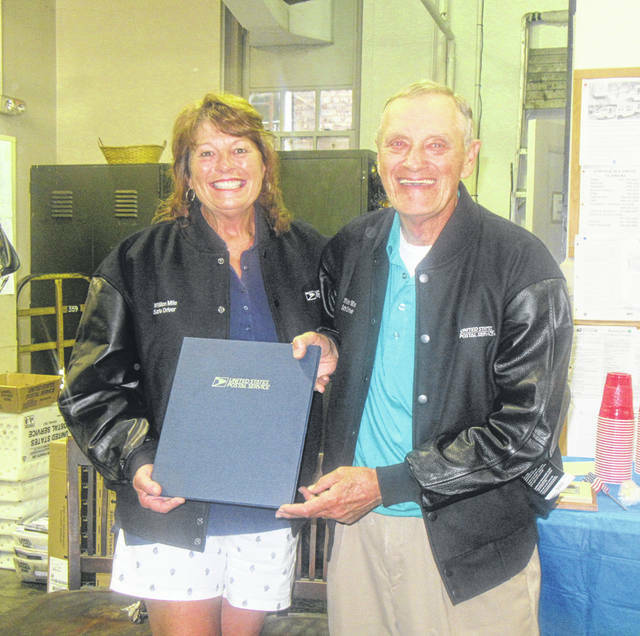 The recent retirements of Jim Pullins and Jan Davis from the Pomeroy Post Office marked the end of an era as the two have spent many years delivering the mail. Pullins and Davis were recently honored with a retirement party which included a surprise for both of the retirees. Dot Norman, postmaster, presented both Davis and Pullins with jackets and pins recognizing both for “One Million Safe Miles” as part of their service. Davis is a third generation mail carrier and the first woman to retire from the Pomeroy Post Office, according to Norman. She served as a rural mail carrier for the office. Pullins was known around town, making his daily walk to deliver the mail to businesses, the courthouse and many homes. After the retirement celebration at the post office, Pullins made that familiar walk around town visiting with many he delivered the mail to each day.